We are surrounded by battery operated equipment of all kinds, and this array is growing still. Manufacturers and designers lean over backwards to make sure that their equipment draws a small current and can thus be operated by a battery. This has its flip side, too. because even if the equipment in question draws only a small current, when it is not switched off, the battery is flat after a few days or weeks. The circuit presented here can prevent this happening. It may be added to all kinds of equipment operating from a 9 V battery and switches this off automatically one minute after a preset time has elapsed. 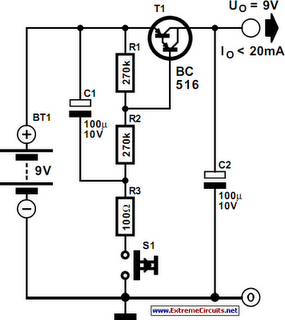 The peak switching current is 20 mA, which is more than enough for most applications. The switch is formed by a p-n-p darlington, T1, which is actuated by push-button switch S1. The very high amplification of the darlington enables it to be kept on fairly long with the aid of a relatively small-value capacitor, C1 (= 100 µF). Resistor R3 limits the charging current of C1 to ensure a long life of S1. Resistors R1 and R2, in conjunction with C1, determine the switch-on time. When this time has elapsed, R1 ensures that T1 is switched off. Since the darlington can handle a UBE of –10 V, a polarity protection diode is not needed.